As we mentioned in our post about 9 Awesome Blogging Tools, a great resource for finding things to write about is BuzzSumo. Add a competitor’s url into the search box and you can see which of their posts are widely shared. Another good site is Word Tracker, which lets you see the search volume, competition, and effectiveness for each keyword you search. You want to select keywords that have a large search volume and low competition so that people find your site easily when they search that keyword. Once you have your topic and post idea, use Portent Title Maker and EMV Headline Analyzer to refine your headline to appeal to the reader intellectually, empathetically, and spiritually. According to Copyblogger,on average, 8 out of 10 people will read headline copy, but only 2 out of 10 will read the rest. So make yours count. Decide on your steps or main points, then include them in an outline of the post. Later, in WordPress, they will be formatted as “Heading 2” and in bold so that they catch the reader’s eye. Many people skim before actually reading a post, so you want them to get the gist of your ideas and then decide to delve in deeper. Now it’s time in the blogging template to actually sit down and write the post itself. Since you have a headline and outline to work with, it should be simple to plug in information under each main point, then add an introduction to the top and a conclusion to the end. Make sure your introduction states what the post is going to share with the reader and your conclusion includes a call to action. What do you want the reader to do after reading your post? We like to write our posts in Google Docs as it automatically saves as you update the document, whereas it’s fairly easy to lose a post in the WordPress editor unless you’re diligent about clicking “Save Draft” every sentence or two. You should always be thinking about capturing subscribers to build your newsletter list. After all, if your site were to go down or social media algorithms change, email would become your only way to communicate with your audience. So how do you convince a website visitor to sign up for your newsletter? You’ve got to provide them with a benefit. This translates into a lead magnet/lead capture/freebie that you offer in exchange for a visitor’s email address. A strong lead magnet provides exceptional value and is like the baited hook on a fishing pole. Good examples are templates and tools, ebooks, e-mail courses, white pages, etc. Anything that helps a reader accomplish one of their goals is a great incentive for them to provide you with access to their inbox. Since you want visitors to be added to your list, you’ll want to send them to a landing page rather than just simply providing the free download. We recommend that you use a site like LeadPages to design your landing page and a service like AWeber to deliver email to your subscriber list. Once a visitor fills in their information on your landing page, they’ll be taken to a squeeze page, which directs them to their email, where they confirm subscription and finally receive their download on a thank you page. Now you can market to them directly, even if they never visit your site again (which is unlikely if you are regularly sending email newsletters as great as ours). 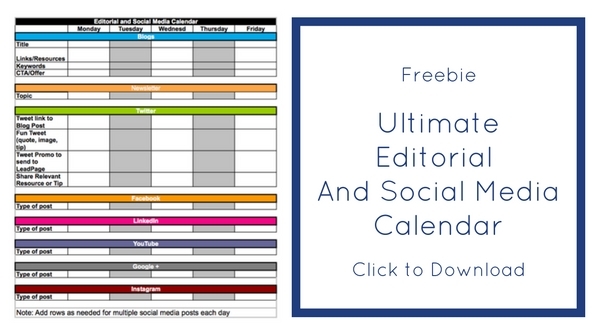 Join our list and get an Editorial and Social Media Calendar (this is an example of a landing page with a lead magnet, by the way). While we use Photoshop for our more in-depth designs, our favorite program for creating quick images for blog posts is an online program called Canva. In Canva, you can customize images by adding text, overlays, and even your logo. It’s great because viewers still know where the image came from if it’s shared on Pinterest or Facebook without the direct link to your site. It also allows you to add the blog title, which increases shares on social media. A blog post without an image is a dinosaur in this day and age. According to marketer Jeff Bullas, articles with images get 94% more views than those without. Another tip is to create a horizontal image for Facebook and Twitter, a vertical image for Pinterest, and square image for Instagram so that all images show correctly on the different social platforms. Where can you find free stock photos? FindA.Photo is a good option as it allows you to search by keyword or color code to match the palette and style of your page. 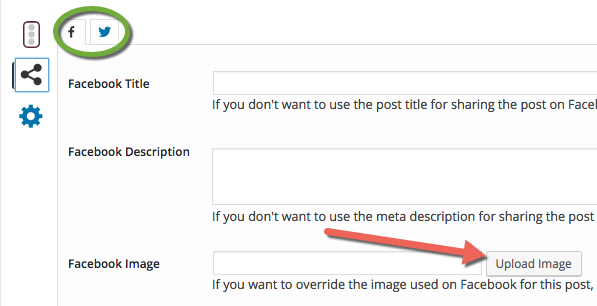 Now it’s time to actually insert your post text into the WordPress editor. This is pretty straightforward. Just make sure you take the time to reformat it as your bold and numbering may not transfer from another application. An important step in your blogging template is to edit the post a few hours or even a day or two after writing it. You want some distance in order to edit objectively. It’s time to upload those images you created. Which image you use as your featured image will depend on your website design and development or the theme you’re using. If the image you want social media like Facebook and Twitter to use is different than your featured image, you’ll want to use a plugin called Yoast SEO. You can insert your social media horizontal image into the Yoast SEO social tab, under “Facebook Image” and then “Twitter Image.” See screenshot below for an example. Yoast SEO also helps with your SEO, as the name suggests. To use it to its full potential, you’ll want to edit the Snipit Meta Description, focus keywords, and meta keywords, and then check to see that you’ve met most of Yoast SEO’s criterion for keyword density. Edit the title and add in keywords throughout the post as necessary. Don’t worry about hitting every single criterion, just generally try to have most of them. When moving down the checklist in your blogging template, consider relevant older posts from your blog to insert as hyperlinks (we recommend at least two per new post). If you’re using a blog schedule, you can reference your calendar to find applicable previous posts. You should also try to insert at least one hyperlink to an outside source like a statistic or resource. You might even consider inserting an affiliate link to earn a little income back (as long as you wholeheartedly recommend the product or service and it applies to the post you’re writing). Don’t forget about that lead magnet and landing page you created. You’ll want to use an image and/or a button to attract viewers to click and sign up for your lead magnet in exchange for their email address. A lot of bloggers who write longer posts insert the opt-in button in at least three places throughout the post (beginning, middle, and end). Here’s an example of a button you might use. Try clicking it to go to one of our landing pages. 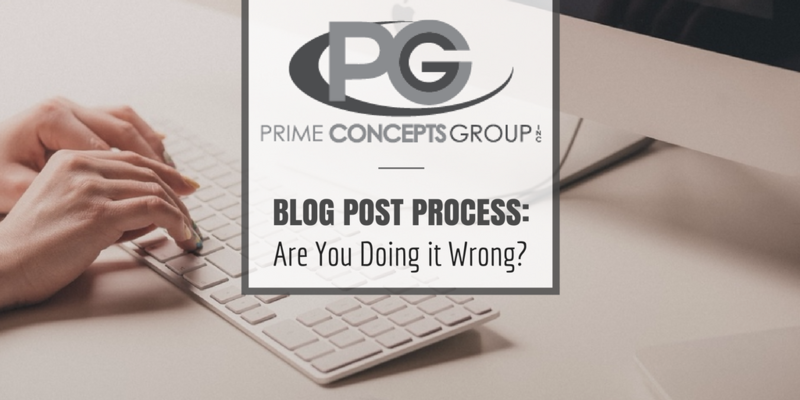 A big secret of successful bloggers is to draft their posts ahead of time. You could write posts a week ahead of schedule, or even a month. When you finish, just click “edit” next to “Publish immediately” and set the date you’ve established on your editorial calendar. This helps streamline your blogging template now and in the future. The ideal way to get your post out to the world is by sharing on social media. Facebook, Twitter, Google+, LinkedIn, Instagram, Pinterest—they all offer unique audiences ready to devour useful content. We use a plugin called “Publicize” to automatically publish posts to our social channels, which saves us time. A useful tip is to add all of your favorite blog posts to an app like Buffer to use as Evergreen content throughout the year. After all, a post can easily be lost on a site like Twitter if you only post it once. Play around with posting at different times of the day and days of the week to see what works best for your audience. This post was a little longer than usual, but we hope you found value in seeing our blogging template. Let us know in the comments if you have questions or any more tips from your own blogging template to add to ours.